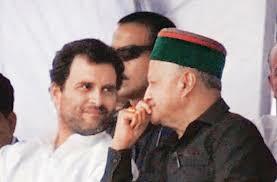 Congress vice-president Rahul Gandhi is learnt to be unhappy with the party’s Himachal Pradesh (HP) government, led by chief minister Virbhadra Singh, for its “failure” to implement the Forest Rights Act (FRA), 2006, in the state, even as declaring occupiers on forest land as encroachers. Keenly aware of how it would erode Congress base in a state still under Congress rule, Gandhi told a delegation consisting of several civil rights organizations, which met him, that it is “totally wrong” on the part of the HP government to declare all forest rights claims in the state were settled even before the FRA, 2006 came into existence. Asking senior Congress leader Jairam Ramesh, former environment minister, to immediately look into the matter, Gandhi was quoted as saying that the Congress is “fully committed” to implementing FRA, 2006, and there “there cannot be any laxity” about it. The delegation – which consisted, among others, of Guman Singh of Him Niti Abhiyan; Jiya Lal of the Him Lok Jagriti Manch; Devi Gyan of the Lippa Sangarsh Samiti,; R Sreedhar of Environics Trust; and Ashok Shrimali of Mines, Minerals and People, Ahmedabad – told Gandhi that the HP government is “misleading” even the High Court about the process of implementing the FRA. “Approximately 95% of the state population lives in villages are dependent on these forests for various livelihood needs”, the representation said, adding, it is this section of society falls in the FRA, 2006. “The forest dwellers are helpless”, the representation said, asked Gandhi to personally impress upon the state government to “implement FRA in letter and spirit and build a fearless atmosphere so that tribals and other forest dwellers are encouraged to file claims under the Act. “Gandhi directed Jairam Ramesh to ensure that the state government clarifies the situation in the High Court and appeals in the court to implement FRA and not victimize forest dwellers”, Guman Singh ,who led the delegation to meet Gandhi, told Counterview. “Congress will take all measures for strengthening gram sabhas and ensure that governments don't side step the processes mandated under the Indian legal system and FRA”, Gandhi added.